Have you ever wondered if you could plant a grape seed and from it, a vine would grow? Normally, this is something that as curious children we do with seeds. In fact, I believe my father has some grape vines outside his home that were planted in this exact way. Yes, technically, you can grow a vine out of a grape seed; however, the grape produced will be different from the grape you consumed in order to obtain the seed. As two parents produce a child that is a blend of both, the same thing would happen here with the seed being the child. Grapevines are grown from vine grafts. The primary reason for this is is due to the Phylloxera outbreak that originally started in France in 1863 and later spread throughout Europe. Because of this, French enologists and viticulturists came to La Rioja to plant vineyards, initiating the wine industry in La Rioja. However in the late 1890s, Phylloxera had crossed the Pyrenees and invaded this grape-growing region as well. Phylloxera, originally native to eastern North America, is a pest of commercial grapevines worldwide. Phylloxera was introduced to Europe when avid botanists in Victorian England collected and imported specimens of American vines in the 1850s. Because Phylloxera is native to North America, the native grape species there are at least partially resistant. By contrast, the European wine grape Vitis vinifera is very susceptible to the insect. These almost microscopic, pale yellow, sap-sucking insects, related to aphids, feed on the roots and leaves of grapevines. Phylloxera attacks only the roots. After employing numerous other methods to try to kill and exterminate this “bicho” (insect), viticulturists found it was simply a better solution to live with it than to struggle to find a solution to kill it. This is where the idea of using grafts of an American vine began. Grafting is a horticultural technique whereby tissues from one plant are inserted into those of another so that the two sets of vascular tissues may join together. In most cases, one plant is selected for its roots; this plant is called the stock, or rootstock. The other plant is selected for its stems, leaves, flowers, or fruits; this plant is called the scion. The scion contains the desired genes to be duplicated in future production by the stock/scion plant. In the case of Phylloxera, the solution was grafting a Vitis vinifera scion onto the roots of a resistant Vitis American native species (Vitis Riparia, Vitis Rupestris or Vitis Berlandieri), as you can see in the two images below. Afterward this graft is usually covered in wax to seal the graft. 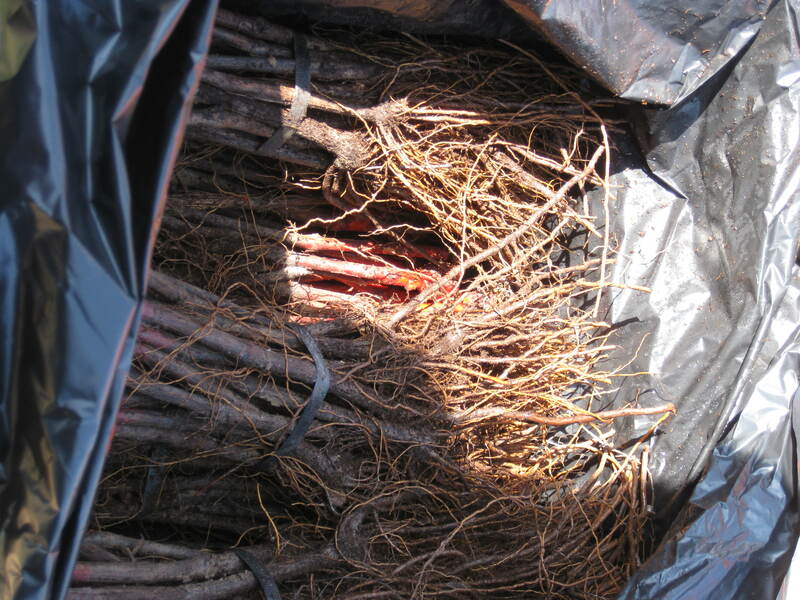 These are then sold, and viticulturists will then plant these rootstocks in the ground—and this is where today’s European grapes come from. 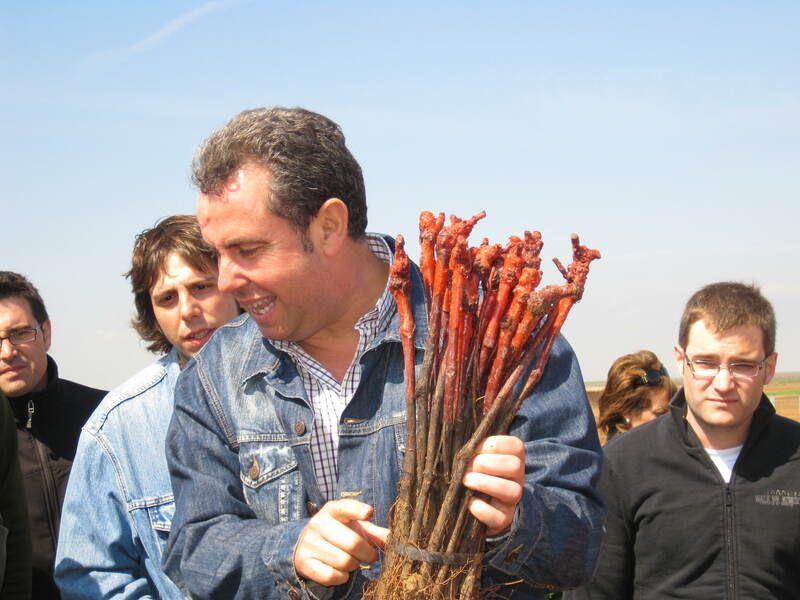 This entry was posted in Spanish Experiences, Understanding the Vines and tagged grape seed, La Rioja, portainjertos, rootstock, Wine. Bookmark the permalink.